Style, power and practicality meet in the Mercedes-Benz GLC Coupé. Its body is a fusion of SUV hardware and sleeker coupé characteristics – and that beauty goes beyond skin-deep. There’s a range of engines, from a 2.1-litre diesel to a 3.0-litre V6 petrol, each of which is reinforced by rapid and precise steering with premium 4×4 support. You’ll find ample space within, making a Mercedes-Benz GLC Coupé lease car ideal for active families and busy professionals alike. Get in touch with AMT Leasing to find out about our latest Mercedes lease deals today. Why lease the Mercedes-Benz GLC Coupe? If you’re looking for a car that combines the ruggedness of an SUV and subtle luxury with a fluid design that creates an elongated, alluring coupe look, then you’re in for a treat with the Mercedes-Benz GLC Coupe. 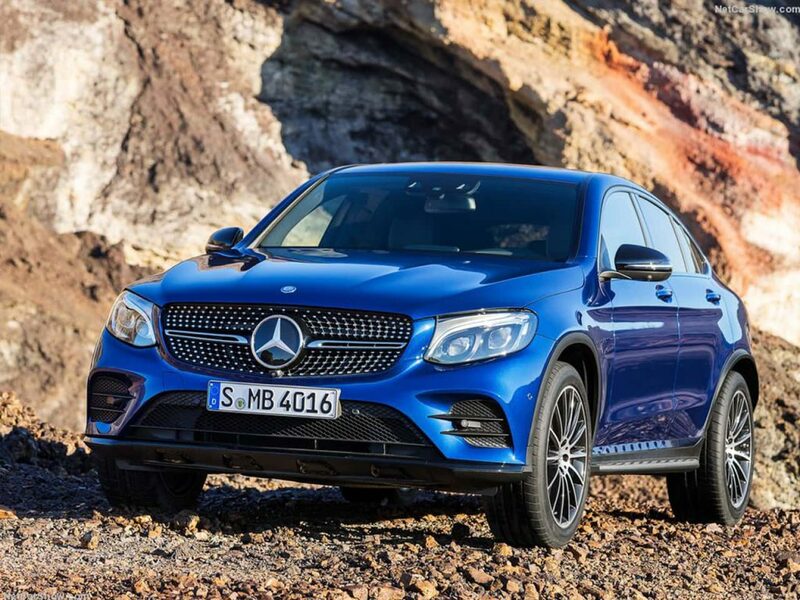 If you’re put off by the traditional squared-off style of most SUV’s, but the low ride and limited space rule out a conventional sports coupe, the beautifully blended design of the GLC Coupe will suit you perfectly. Starting at the Sport trim, even the base models are full of futuristic features and packed with unparalleled performance. The range is made up of 2.1-litre, four-cylinder diesel engines in 220d or 250d, but if you’re looking for more power, the super smooth six-cylinder in the GLC 350d Coupe with a rapid 253bhp and 620Nm of torque offers serious pulling power. The AMG 43 model packs a twin-turbocharged 3.0-litre V6 petrol engine and is incredibly quick for a car of this size, reaching 62mph in just 4.9 seconds. And this racing appeal isn’t limited to beneath the bonnet, with the AMG body kit, alloys and decals adding to the sporty feel. Both the GLC 220d Coupe and the more powerful 250d claim a decent 56.5mpg combined, while CO2 emissions are at 131g/KM in the Sport trim. All of the Mercedes-Benz GLC Coupes offer retuned sports suspension, plus adaptive dampers and variable driving modes thanks to Mercedes’ Dynamic Select. With Sport mode, you’ll feel sharpness in the gearbox, weightier steering and stiffer suspension. The Sport trim is extremely attractive, featuring chrome trim and 18-inch alloys as standard. If you want more, move up to the AMG Line to enjoy 19-inch alloy wheels in titanium grey. In the cockpit, Dynamic Select allows you to customise the car up to match your individual driving style, using the full range of the 9G-Tronic automatic gearbox. Mercedes-Benz Intelligent Drive ensures a relaxing and confident driving experience in every situation, while the Command Online System displayed on the 7-inch screen features clear controls and intuitive mapping. The standard pack consists of an impressive range of intuitive technologies, including a reverse camera plus Parking Guidance, Garmin sat nav, Bluetooth, leather seats, climate control, an electronic tailgate and heated front seats. On the exterior, there are high performance LED headlights with integral daytime running lamps. In the AMG Line you can enjoy Artico leather seats, sports pedals and luxury floor mats, as well as a flat-bottomed steering wheel that offers enhanced grip. Space is plentiful, with generous front seating, a multitude of cabin storage and a rear that easily accommodates two adults. At AMT Leasing, we offer a range of Mercedes-Benz cars to lease as well as the GLC Coupe. Simply chat with our leasing experts online or browse the comprehensive range today to find a Mercedes-Benz finance deal that suits you. If you’re looking for an alternative to the Mercedes-Benz GLC Coupe, then check out our offers on BMW X5, Volvo XC90 or Audi Q7.